Bernard Tomic and Ajla Tomljanovic fell in the first round at Indian Wells on Thursday - while Jordan Thompson's campaign was compromised by injury. 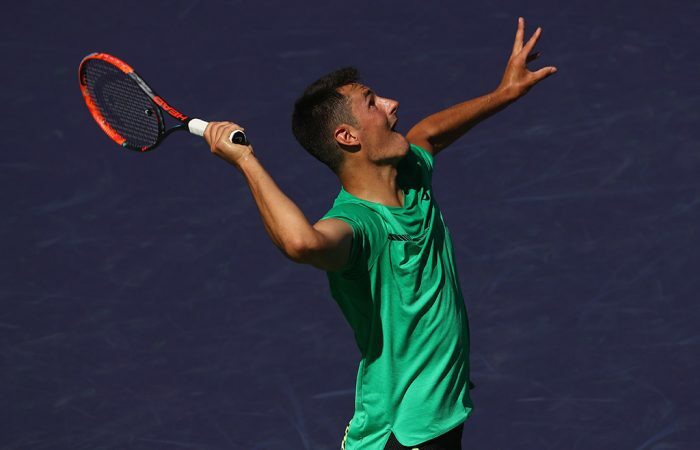 Bernard Tomic’s search for confidence continues after the Australian eliminated in straight sets by American wildcard Bjorn Fratangelo in the opening round of the BNP Paribas Open at Indian Wells. At the same time, Ajla Tomljanovic fell 7-5 6-2 to Julia Goerges, who will go on to face Australian No.16 seed Sam Stosur in round two. Tomljanovic only returned to tennis last week in Acapulco after a 13-month stint on the sidelines battling a shoulder injury which required surgery. 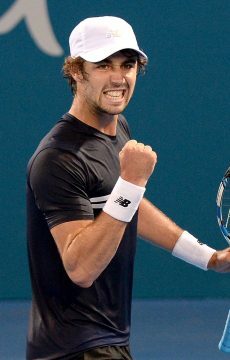 Later on Thursday, Jordan Thompson retired injured when trailing Mikhail Kukushkin in the third set of their first-round match. Thompson turned his ankle when leading 3-0 in the first set; despite taking the opener 6-1, he was increasingly compromised as the match wore on. Kukushkin hit through the Aussie to take the second 6-1 and broke serve twice in the third set before Thompson called it quits down 0-3. “Slight roll. Well, more than slight. Just got wrong-footed and my ankle went from underneath me and felt a fair bit of pain,” Thompson explained. “It got taped immediately; I knew I couldn’t play straight away. The tape held it in the right spot but the pain was too much. “I’d barely missed a ball and I was up 3-0 with Kukushkin serving at 0-30. Yeah, it’s really disappointing. Tomic’s 6-2 6-2 defeat to world No.112 Fratangelo means the Queenslander has bowed out of the first round for the fourth successive time since his third-round exit at the Australian Open. World No.42 Tomic won fewer than a quarter of points on his second serve and was broken twice in both sets as wildcard Fratangelo sent down seven aces to Tomic’s one on Thursday in the Californian desert. The American will next meet 13th seed Tomas Berdych in the second round. Tomic also suffered opening round losses at the Memphis Open, Delray Beach Open and Mexican Open in Acapulco, where he retired because of the heat. “Obviously I’ve been playing bad the last few weeks but it’s something that I’m trying to turn around,” Tomic said. “Today wasn’t the best match for me and obviously when you start playing bad it becomes a little bit of a roll. So I have to turn that around and find the way to (do that). His next assignment will be teaming up with Spain’s world No.6 Rafael Nadal in the doubles at Indian Wells. Meanwhile, Tomljanovic was in good spirits despite her loss to German Goerges. The 23-year-old led 4-1 in the first set and had two breaks points for a 5-1 lead in the opening set before Goerges, the world No.50, stormed back to win six of the next seven games. Tomljanovic went down an immediate break in the second set before Goerges wrapped up victory in one hour, 32 minutes. “A loss has never felt so good (laughter). Like genuinely hasn’t felt so good. I’ve never been this upbeat after a loss. Which is a good sign,” Tomljanovic said. “Sort of new a perspective, appreciation for the sport. I’ve been out, literally in my head, for like a year and a half. I played Australia last year but my injury started way earlier. It feels like I’ve been away for decades. “Just to be here and be competitive with these girls (is great). I’m not far off – it’s just little things now that at this level are important.